PNY, a company celebrated for its small technology innovations, presents The Family Car Charger. This could be the solution to LONG rides punctuated by frequent enquiries of ‘Are we there yet?’. This nifty gadget will be welcomed by the whole family, including those in the front. This neat device has four universal USB ports and a flexible 1.8m cable. That’s plenty of wire to enable easy use by the power-hungry folks in the back, with 3 ports just for them. That says that if you only have two kids now, then have another one before this package arrives or there will be an inevitable fight over that extra port. There is one port remaining in the front but that should be enough to allow the navigator to keep the smartphone charged for mapping use. 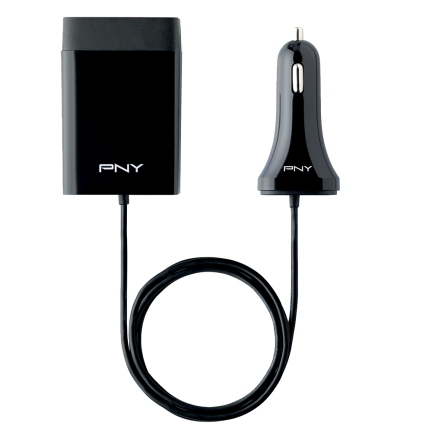 The PNY Family Car Charger is simple to connect. Just plug into what was once the cigarette lighter (were they the good old days?) which is now ‘the vehicle’s 12v power outlet’. The Family Car Charger also comes bundled with a handy clip that attaches to the back pocket of most car seats, to make the charger more easily reached by surfers in the rear. With up to 5.8 Amps of charging capability, this charger is powerful enough to take on Tablets, Smartphones, MP3 Players, etc. This is one of those ‘why didn’t I think of that’ solutions to the perennial problem of keeping the family amused, distracted and even educated – yes, charge that e-reader, too. Deep and silent joy! The PNY Family Car Charger will fit in the glove compartment or door storage when not in use. This is an indispensable travel accessory and at a very reasonable price.